On Tuesday March 20th, Professor Truman and his Teaching Assistant Kili presented a lecture about the Evolution of Flight at NYU. They brought me along to help illustrate the information they were presenting. The class they were presenting to is about the History of Aviation and Aviation Technology so it was a fairly relevant comparison to look at not only how aviation technology evolves with time but also how flight evolves in the natural world. The lecture covers the step from no flight to flight and then draws coincidental parallels between natural avian structures and human designed airplanes. Here are the power point slides from the lecture in the video above. "If Truman were intelligently designed, he'd have hands so he could write books on the fly!" Fossil Cast of Sparrow Sized Pterodactylus Kochi. It evolved flapping flight similar to birds but with skin membranes instead of feathers. Thanks for sharing the fun and informative presentation. I love the South Park evolution lead in you used. Hi Michael! I am your fan. I live in Brazil and I also love aviation. I saw a video where you were the pilot. It is a hobby or do you work with it? I quite appreciate your work with the parrots. Congratulations. I watched the hole thing... very interesting! Good job, you give lectures often? I have to admit, I kept on thinking 'what if they poop on someone??' But they were so well behaved!! This was the 3rd year I've done a lecture for this professor's aviation courses. I've been giving one every year as a guest speaker. The first one was about gliders, soaring, and soaring weather. The second lecture I brought Truman along to help me discuss ornithopters. That lecture was about failures to build flying machines by focusing too much on birds and how it took 100 years since making an artificial flying design that humans were able to put all they've learned into the [url=http://www.youtube.com/watch?v=0E77j1imdhQ:2gvaa3ea]first (and not that great) human powered ornithopter[/url:2gvaa3ea]. I have the freedom to choose any topic I wish to discuss so I've been jumping around to whatever I'm interested in the moment. However, I have a special place for that boundary between bird and plane so it has been a common theme. The main reason I brought both birds this year is because Truman is bigger but Kili is better at letting me grab her wings to show. I can actually hold her, open her wings, and wiggle her alula (thumb) to show how it works. Truman gets agitated and doesn't let me do it for long. Hopefully in 2 years he'll be like Kili in this regard. Kili just loves being grabbed and handled. She actively seeks it out and puts herself into my hands. They don't poop on the fly so that wasn't a concern. They fly around the apartment but only poop from their perches. That's why I brought a training perch with me. If anyone has any questions on the subject matter, feel free to ask. I have a question... You talked about how flight evolved from no flight to flight, this ofcourse also happened in the natural world but what is your theory on birds that went from flight to being flightless? I assume they still have the same structures in their wings as flighted birds. But wouldnt you agree it is definitly an advantage in being flighted as opposed to having wings and flightless? Why did they lose this ability when it is clearly an advantage? Why hasnt evolution given them arms again when they didnt need their wings anymore, arent they completely useless now? These things make me question evolution and the intelligence og it. You do talk about Truman not being an 'intelligent design' but it is one thing for something not to be smart or highly intelligent, its another when it just seems stupid... why would evolution take a species and have it go backwards so the evolvment in the end turns out to be a disadvantage. Or maybe evolution just screwed up when it comes to these flightless birds... the human race certainly seems to be going backwards. Just interested on your theory on the subject of going from non-flight to flight and then to non-flight. [quote="rebeccaturpeinen":1lbgl067] Or maybe evolution just screwed up when it comes to these flightless birds... [/quote:1lbgl067] Rebecca, penguins for example, do "fly" - but in a different fluid (air is a fluid), namely water! Evolution has just adapted them for that task as their hunting grounds are below the surface . [quote="rebeccaturpeinen":3me35u0n]I have a question... You talked about how flight evolved from no flight to flight, this ofcourse also happened in the natural world but what is your theory on birds that went from flight to being flightless? [/quote:3me35u0n] This is actually quite simple and more easily understandable than gaining flight initially. The mechanisms for gaining flight are rather complex. The mechanism for losing it in a flighted creature is simply to stop using it. [quote="rebeccaturpeinen":3me35u0n]I assume they still have the same structures in their wings as flighted birds. But wouldnt you agree it is definitly an advantage in being flighted as opposed to having wings and flightless? Why did they lose this ability when it is clearly an advantage? [/quote:3me35u0n] They do have the same bones and feathers as flighted birds indeed. However, usually what makes them flightless is that the wings are disproportionately small and weak that they cannot fly with them. But I don't agree that it is "definitely an advantage in being flighted as opposed to having wings and flightless." 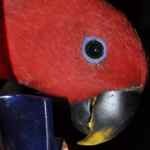 Now before someone makes a smart comment I'm talking in the long term evolutionary sense and not related to keeping our parrots flighted because they are physically different. You think flight is an advantage because you are using to seeing birds using flight to their advantage. That is because in most parts of the world there are benefits to flight. However, this isn't always the case. New Zealand and Pacific islands are an excellent example. At some point in history migratory birds got blown off course and became misplaced on some remote pacific island. They settled on the island as food (plants/insects) were plentiful while there were no predators as they cannot swim across the ocean. Thus these (still flighted birds) lived on the island. Some of their descendants were born with bigger legs while others with the same. Well the ones with big legs could run faster and catch ground insects better or reach new food sources before others who couldn't run as fast. This is a concept of evolving greater ground adaptation. Remember, most birds are arboreal because the ground is teaming with predators. However, in the absence of predators they are free to spend much time on the ground foraging for food. Without predators they are free to eat and grow more than normal so they tend to become quite bulky. Now on the other hand, flight is very costly in terms of energy. Flighted birds have to be lean to avoid excess weight. But since they spend most of their time on the ground, following generations end up using flight less and less. No new evolutionary adaptations develop for improving flight. Meanwhile those other advantages like bigger legs, bodies, etc continue. So in a way, they evolve themselves out of their wings. So the wings remain small or smaller (why waste resources on what you don't need anyway). Chickens are a great example. They have been artificially selected for being meaty. Well they feed on the ground and have no use for wings. There is no selective pressure for improved wings. So as the chickens become bigger breasted on the same little wings, they become less capable of flying. This isn't a disadvantage because even free range chickens just run around eating worms and seeds on the ground. Thus being flightless is actually an advantage[/b:3me35u0n] under certain circumstances. The once flighted birds begin to occupy niches unoccupied by the typical terrestrial animals. Yet they still have advantages of being birds like having feathers for insulation. [quote="rebeccaturpeinen":3me35u0n]Why hasnt evolution given them arms again when they didnt need their wings anymore, arent they completely useless now? [/quote:3me35u0n] Well that's just the thing. Evolution doesn't "give" anything just because it might be nice. This is why I had the Truman picture saying it might be nice to have arms but the trade off of having wings is that the wings really just are the arms with special feathers. Wings are specialized arms where some fingers were lost and others fused to save weight. All the primary feathers are attached to a single finger anyway and the alula (thumb) is used for landing. Otherwise unnecessary. So going from this stick of an arm to hands isn't simple. But nor is it particularly necessary. Watch how a chicken or pigeon go around "armless" and yet they manage to get by. [quote="rebeccaturpeinen":3me35u0n]These things make me question evolution and the intelligence og it. You do talk about Truman not being an 'intelligent design' but it is one thing for something not to be smart or highly intelligent, its another when it just seems stupid... why would evolution take a species and have it go backwards so the evolvment in the end turns out to be a disadvantage. [/quote:3me35u0n] You're right. To say that birds are designed to have wings without arms or flightless wings really does seem stupid! But the fact of evolution really allows it to all make sense. Being flightless isn't a disadvantage in the environments in which it occurs or it wouldn't happen. If a bird were born flightless in north america or europe it wouldn't live to make it out of the nest. Yet in places where there are no predators, all the food is on the ground, there is no competition on the ground, etc, the advantage of being flightless is that the bird can be bigger and puts its resources into elements that ARE to its advantage. Don't you love seeing [url=http://www.google.com/url?sa=t&rct=j&q=&esrc=s&source=web&cd=1&ved=0CDQQtwIwAA&url=http%3A%2F%2Fwww.youtube.com%2Fwatch%3Fv%3D9T1vfsHYiKY&ei=J-BsT_L2BIiftwfBs8igBg&usg=AFQjCNEqYp7oZ6_t32YUKebsFTyqWxm3PQ:3me35u0n]videos of the Kakapo, a flightless parrot of New Zealand[/url:3me35u0n]? Could you imagine that hunk of lard being able to fly??? No way, too big and heavy. It wouldn't be possible to have wings strong enough for that to fly. Yet without predators or ground animals eating the food there, the Kakapo can revert to living in a smaller area of land than flighted parrots in other parts of the world and it can be a bigger bird. Surely that's an advantage where it lives (at least till humans/predators were introduced). So I hope this helps you understand that evolution does in fact serve a purpose whether it appears to be going forward or back because it is relative to the environment and circumstance. Just because we envy flight or think of it as progress, success is really measured by results. If the result of losing flight leads a species to survive, then that is progress in the evolutionary sense.